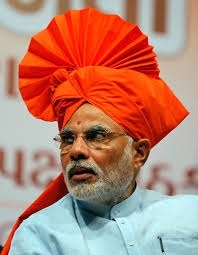 A Prime Minister of a Country which is not a Banana Republic is not expected to make public announcements abroad through his hat-sorry, turban. He is expected to have figures by which he can stand if challenged. So what is being done to haul up these supposed national looters and recover the money? Why didn’t the Finance Minister, Mr. Arun Jaitley, go by the words of his boss and have the four arrested? Why aren’t the tax authorities unearthing their black accounts and blacker money? That you cannot take vengeful action will be a stupid argument – you owe much more to the people who elected you than to those who might cry vendetta. Since nothig of the kind is being done, one concludes than Mr. Modi did talk like Presodent Mobutu, or, if you like, Donald Trump – both Banana Republicans. Even at 60 (+surcharge etc.) percent penal rate of tax, some 2625 crore Rupees will be realized. All the announcements have been in Rupees while the previously predicted money in banks was in US Dolallars – all of 2.1 trillion on 2100 Billion – some 1680 dollars – 1,09200 Rupees approximately in every Indian pocket (not 15 lac). The catch is this : the money hidden away abroad is in US Dollars or Euros. You have not got back that money from abroad. Some 600-odd smart alecks are paying you income tax and getting away by paying Indian rupees from their local lockers while still keeping their money in Dollars or Euros. abroad. Your productivity has been abysmally low; your imports have fallen. Only thing that rises is the amount of rupee needed to buy a dollar. As a net importing nation, you should get that money in dollars into RBI. As far as I can see, since Jaitley is talking about rupees, under the circumstances you might as well print 2625 crore Rupees. Now 4177 crores is some 6640 Million dollars. That is 0.032% of the 2 trillion estimated by Jaitley’s party. It’s like Jaitley went to catch a blue whale and came back screaming with delight that he caught a sardine. The 2525 crore collected, if distributed to every citizen, would put in less than 25 rupees instead of the Promised 15,00,000 to 20,00,000 Rupees that the poor voter was promised. 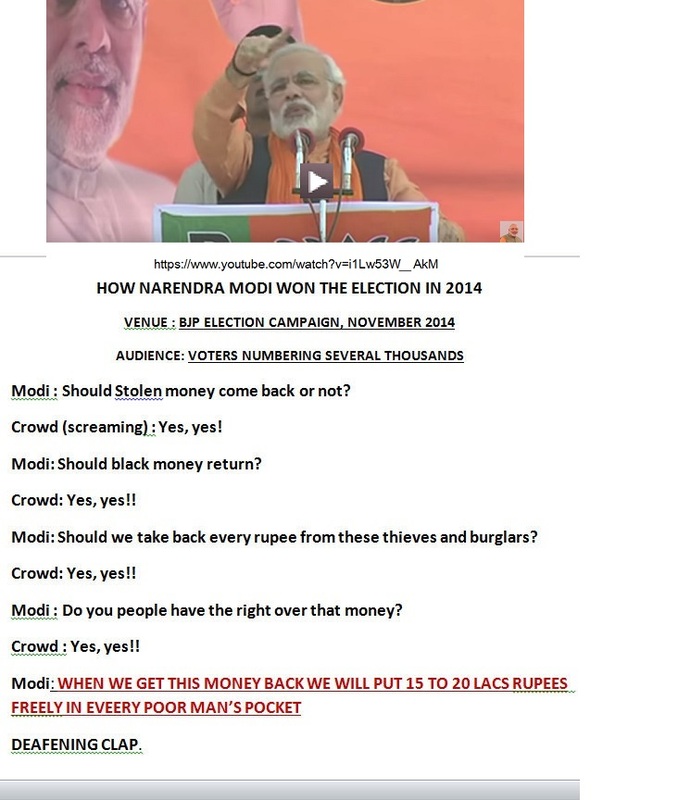 Does not false promises and cash incentive to voters amount to corruption? The true picture is distressingly different despite the large budget allocation that the Finance Minister made for this campaign. You find a advertisement every day with more interesting concepts being shown on BBC, CNN, NDTV, YouTube – all the visual media that one comes across. This should cost the poor tax payer like myself heavily with no return in sight. 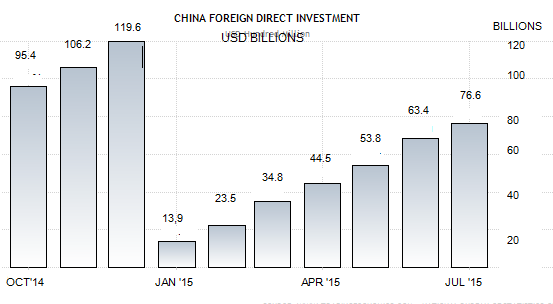 You find that Brazil has been receiving a healthy quantum of investment from abroad although its economic growth is said to be ‘waxing and waning, and its economy has not grown beyond 2.2% during the past two years. 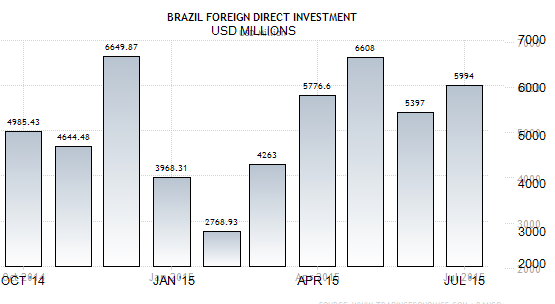 During the ten months I refer to, Brazil which runs no comparable campaign for investment has received over US Dollars 53 Billion. Here, we see an interesting pattern belying all the public claims made by the Prime Minister and the Finance Minister. 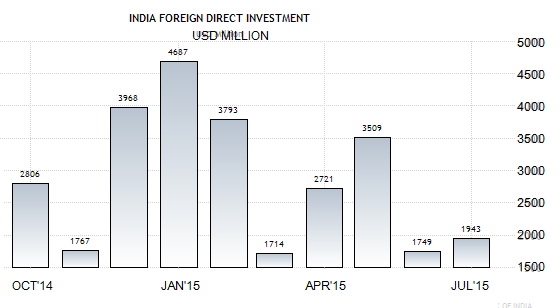 Even at the best of times, India does not surpass the average Foreign Direct Investment into Brazil. The scale tops at 5000 Million (5 Billion) whereas Brazil tops at 7 Billion. The total inflow to India is to the tune of 28.6 Billion; a little more than half of the dollars that went into Brazil. Don’t discount the fact that the population of Brazil (200.4 Million) is less than a fifth of India’s. Liked or disliked this blog? Publish your comments below. Your views will not be edited or modified. Kindly avoid profanity.